Do come along and join in, all welcome. The other classes restart April 23rd. Or come along to class and let's chat before you get started. Open class, new term starts April 23rd. 7-weeks, £56. Get in touch with enquiries. Yoga mats provided. ​Class runs during school term time. Sorry no classes during Easter Hols 9th or 16th April. New (or new-ish) to yoga? 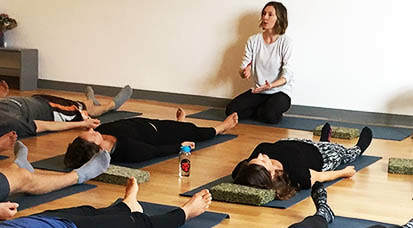 Join this pre-class session for a one-off introduction to yoga practice. I recommend anyone new to yoga to take this session - either prior to joining or alongside your class. The induction is designed to allow you to understand the basics where we can take our time and introduce things. Small group setting. £6, or free with a term booking or 5-class pass, or £4 with 6:30pm class. ​Best combined with the 6:30pm class following this session to practice what you have learned. Please contact me to reserve your space. Upcoming dates: 24th April, 15th May, 12th June. Open class, drop-ins or term bookings welcome, simply turn up or get in touch with enquiries. Yoga mats provided. Class runs every week. Get in touch to join the waiting list. Next term: 25th April - 23rd May, 5-weeks. £40. Space tbc. Drop-ins welcome, simply turn up or get in touch with enquiries. Yoga mats provided. Class runs every week except Bank Holidays. Delve deeper into yoga practice and establish a firmer foundation. If you've been attending group classes or enjoyed a yoga retreat then this course will ensure you explore the groundwork which can enrich your practice ongoing. Develop your skills and techniques within the broader framework of practice and understand their roots and their philosophical underpinnings. Small group setting for interested yoga practitioners or those interested in Viniyoga. ﻿You are welcome to join the yoga term at any time when there are still spaces. Fees are simply pro rata for the remainder of the term or 'drop-ins' are fine for some classes (check the class details). Try to find a regular class and time which can make such a difference to how much you benefit from the practice and ensures you develop your techniques and can practice safely. If you are pregnant or have a significant mobility issue, please get in touch before coming. Please come to the 11:10am Friday class which is 'pay-what-you-can' on the day. Most classes you are welcome to simply turn up on the day (10 mins early to your first class please). ​If it says 'fully booked' in the details, please get in touch to join the waiting list. Missed classes can be made up in my other classes during the term (up to 2 each term). Classes run in terms to support your regular practice. You will become familiar with the term theme and this will help develop your practice skills. You can also come along to classes as a drop-in for some classes if regular practice isn't possible. The 15 class pass, valid for 3 months, is the most affordable way to practice with me. See above. Or through a MoveGB membership. You can make up a missed prepaid term class in another of my classes during that same term - please check in with me first. Princes Place, Bishopston, Bristol, BS7 8NP. Visit Bristol YogaSpace for more info. Let's keep in touch. If you want to find out more about my classes, workshops, term dates or events, please join my yoga email list. I'm always around to chat either before or after the yoga class if anything is curious, difficult or causes any adverse effects. Do come and chat through if you have any questions, I'm happy to help. I regularly teach extended yoga sessions at Bristol YogaSpace on Sunday afternoons. They offer a chance to practice, discuss themes and find out more about practicing yoga. I encourage all yoga students to come to yoga workshops to take their practice further than a weekly class allows time for. Also a great introduction to those new to yoga.